This recipe is a savory veggie (sabzi) dish made in traditional, Indian style. As i mentioned in my previous post, pumpkin is also used for making various savory dishes (commonly known as sabzis) in many parts of India. Since India has a diverse food palate, pumpkin preparations are varied. In Southern parts of India, for instance, pumpkin gravy sabzi would most likely have coconut milk and be tempered with mustard seeds and curry leaves. The northern part usually uses cumin seeds to temper. This recipe is my home style pumpkin veggie recipe. I have always been eating my mom cooked pumpkin this style at home and to my culinary senses, this tastes absolute divine. At our house, this veggie/sabzi is considered a traditional dish and would usually be served with pipping hot pooris (unleavened deep-fried Indian bread) and mint-coriander chutney. 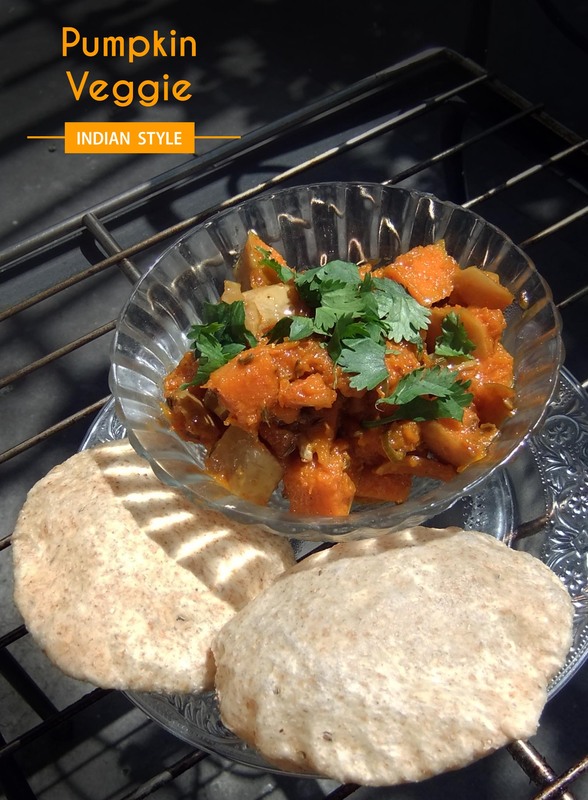 This recipe is my attempt to re-create my home style pumpkin veggie/sabzi. This dish is tangy, spicy and slightly sweet. The combination of all these elements in one dish is simply mouth-watering and addictive. Garnish with loads of coriander and savour it !! Take a pan/ kadhai. Pour in ghee/oil and let it melt on high flame. Add in the asafoetida, fenugreek seeds, fennel seeds, whole dried red chillies, cinnamon stick and bay leaves and let the fennel seeds come to a splutter. Now, add in the turmeric powder, chopped green chillies, grated ginger and saute for a minute. Now, to the pan, add in the pumpkin chunks, salt and red chilli powder. Mix well, cover with a lid and let it cook on simmer for 15 minutes or till the pumpkin chunks are cooked and tender. Add in 2 tablespoons of water to prevent the pumpkin from sticking to the bottom of the pan. Uncover it in between and mix so that the tempering is evenly coated on all the pumpkin chunks. Once the pumpkin veggie is cooked, remove the lid and add in the tamarind chutney/ paste, jaggery and garam masala. Pumpkin Veggie is ready. To serve, remove the bay leaves and cinnamon stick from the cooked veggie, add in chopped coriander and serve with hot chapatis, parathas or pooris. This dish is as good as it looks. The tangy taste makes it really interesting and it goes well even with rice. To me, the flavour from fennel seeds really adds an interesting and very light sweet taste to this dish. The jaggery gets caramalized and imparts a slightly roasted appeal and flavour to the pumpkin which really complements the entire dish. Tagged halloween, indian, Lunch, Spicy. Quick and easy recipe. Really good to prepare any time. Like it.